Time stands still - you're definitely in Florence. Its undeniable that Florence has a charm of its own. There's something about Tuscany's capital that is hard to explain - could it be the magnificent historical landmarks such as the Duomo, Giotto's Campanile and Palazzo Vecchio? Perhaps the unique beauty of its many sculptures and paintings? Or maybe that spectacular sunset over Florence surrounding hills? From our perspective, it's all this and more, much more. In fact, this might be one of the cases where an image speaks for a thousand words - an image like the one enjoyed from Terrazza Brunelleschi, atop of Grand Hotel Baglioni, one of the most amazing views you can ever experience over Florence. Here's a terrace that will leave you breathless, with an uncontrollable desire of taking as many pictures as you can. For those in love, here's a perfect place to share a meal with your loved one, a love witnessed by a jaw-dropping panoramic view of Florence. For those not too hungry, we recommend you to taste the magnificent Italian "antipasti" with a glass of wine - as perfect as it gets. For those cold winter nights, we suggest a dinner at the indoor Terrazza, also with an outstanding Florence view. 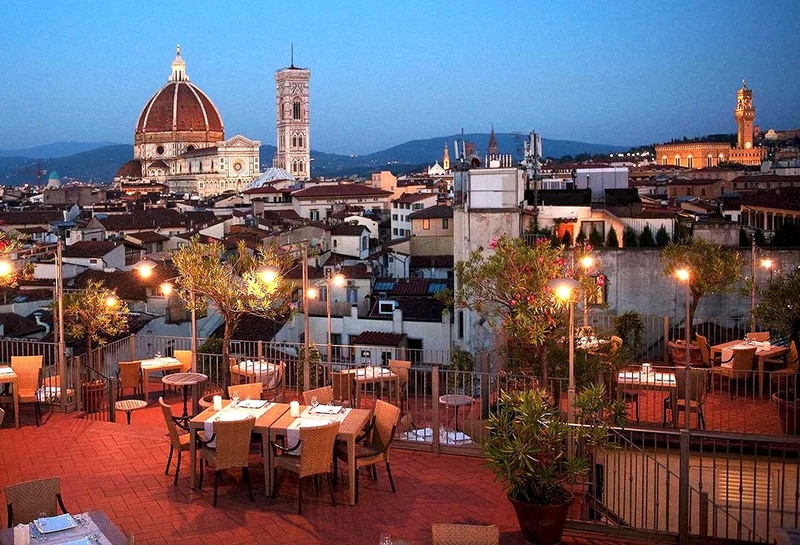 Luxury, boutique hotels in Florence with romantic views. Stay near Florence attractions such as the Duomo and Arno river, among other prime Florence areas.